Fall is upon us…right? I mean football has started, pumpkins are out, mums are blooming, so even though the calendar doesn’t say that it is Fall, it is Fall to me! 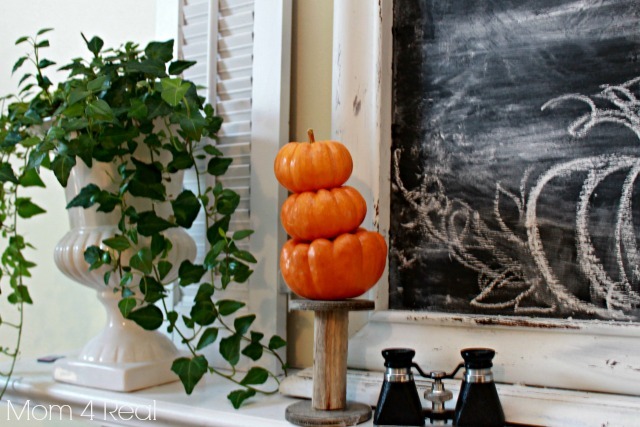 As soon as I saw pumpkins at the grocery this weekend, I knew I was ready to decorate my Fall Mantel. This may be my favorite mantel yet! I painted this huge chalkboard last year for my The Notebook Inspired Valentine’s Mantel, and haven’t wanted to take it down…it’s so much fun to change with the seasons! I wanted to draw a few fun pumpkins for Fall, and found the perfect tutorial oh how to paint a pumpkin on my friend Jennifer Rizzo’s Blog, and decided to follow her instructions, but draw mine instead. Her pumpkin painting is soooo super fabulous, I’m going to give it a try myself! 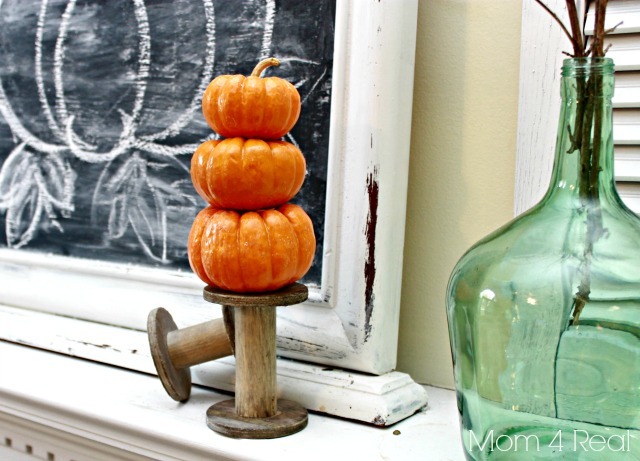 I had these wonderful wooden spools that I bought at a local Lexington store, Finders Keepers Market, and decided to stack some mini pumpkins on top of them for some fun pumpkin topiaries…cute, right? I added my Aunt Irene’s antique binoculars and an ivy plant in an urn. I took down my fireplace screen and stacked a large copper boiler on top of an old painted army trunk. 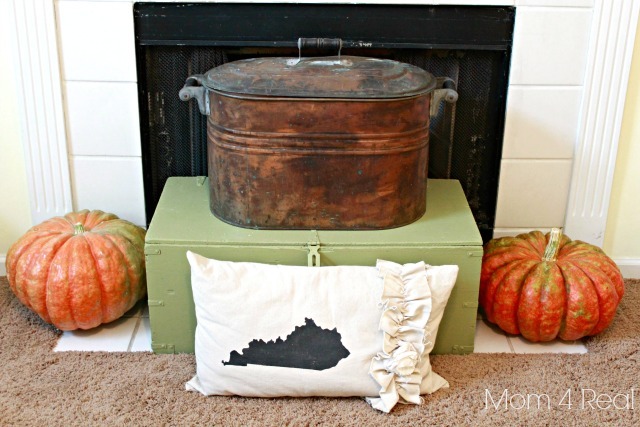 I placed my Kentucky Silhouette Dropcloth Pillow in front and added a couple of large pumpkins. I painted some shutters that I found at the Peddler’s Mall and added a few more details, and took a step back. I just love it! 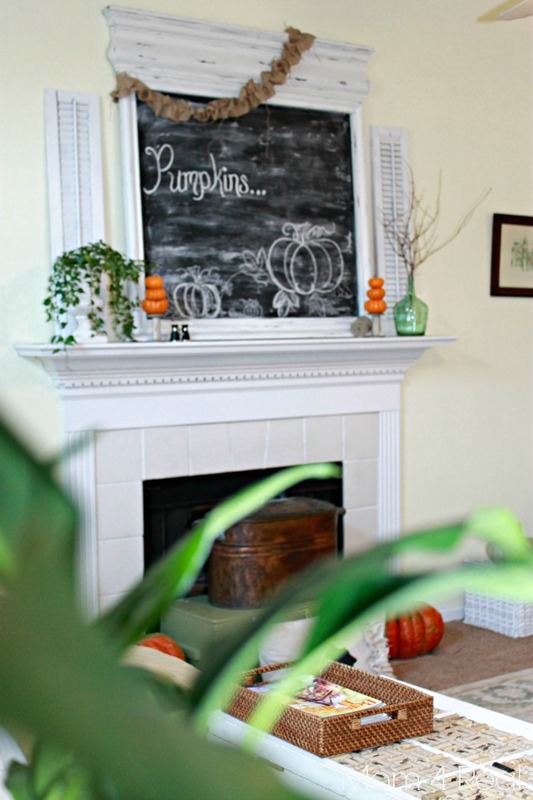 I love walking in to the room and seeing all of the touches of Fall…they just make me smile! What do you think? 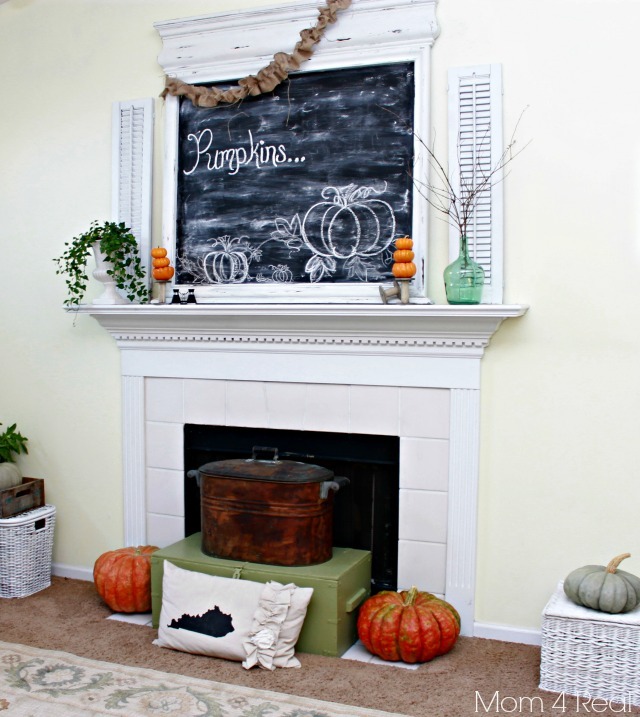 Are you ready to decorate for Fall? Sharing at Homestories A to Z, Savvy Southern Style, StoneGable, The Inspired Room, and Tatertots and Jello! Love this Jessica! 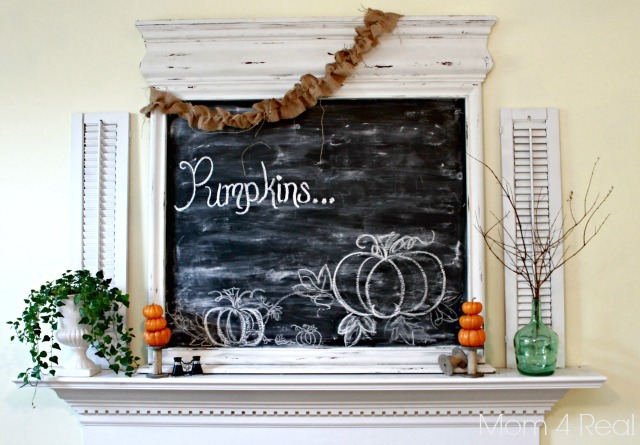 Your mantel is so pretty- the giant chalkboard with pumpkins is perfect. I love your drawing! There is that Kaaantucky Pillow! ;) Cute Jess! Looks so cozy, care if I head over in 5 for some coffee? Totally ready for fall – even though it’s like a million degrees here this week! Great mantel! So pretty fresh & fall! Will FB! Love it! I have one of those copper boilers, too….my mom gave it to me when she moved into her old lady apartment. It looks so fresh and fallish! It looks great! I LOVE it Jessica!! It all looks so beautiful and the stacked pumpkins on the wooden spools are darling. Well done! Did you glue the pumpkins together? WOW is your mantel looking oh so spectacular. 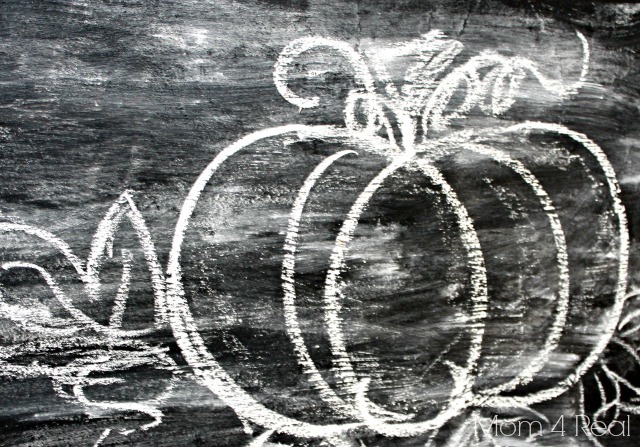 I LOVE the chalkboard and you did such a fine job on the pumpkin art. Cute Jessica! 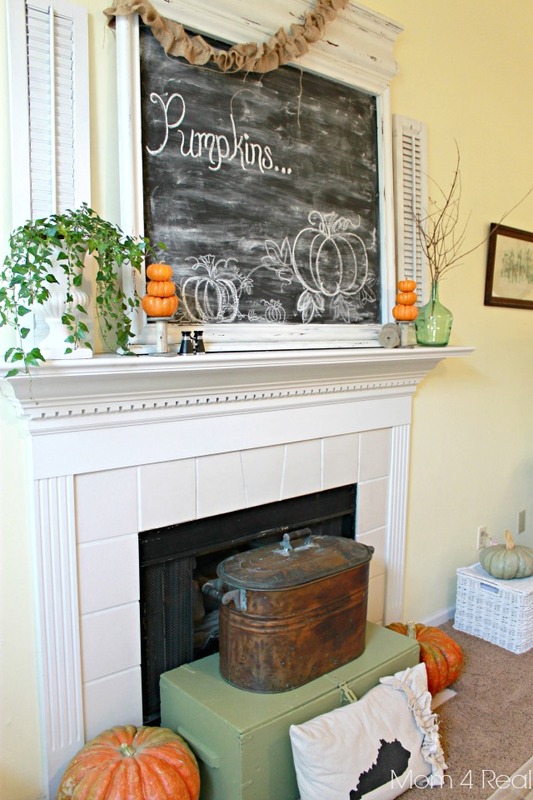 Love how your big chalkboard is the focal point of your mantel display. Love all your touches of fall. I love it, Jessica, especially the chalkboard backdrop! You’re quite the “ar-tiste …” fabulous pumpkin! Pretty pops of green, too. Did you use your new flash? Great pics! Ooh I love it all, but the Kentucky ruffle pillow is my favorite– totally adorable! That huge framed chalkboard is amazing. I would squeeze every ounce of use out of it, too! Thanks so much for the inspiration, Jessica! Hope you’re having a wonderful week! I love your mantle. Once of the cutest things I’ve seen thus far at the Linky Party. You are very talented.